The oven’s on and the bread’s baking, order today! Ah, party trays. Thanks to the hastily prepared, half-decayed grocery store offerings, they’ve gotten a bad rep. But when you have client meetings to cater, field trips to chaperone, or celebrations to host, PSUB party boxes are the easiest way to fill bellies. With catering by PSUB, party trays are no longer a last minute act of desperation grabbed at the store to stave off hunger strikes. The signature subs that comprise party boxes from Planet Sub deliver satisfying experiences in every bite. We make it convenient for you to enjoy PSUB anywhere by cutting our subs into 3-inch serving sizes perfect for your next conference, meeting, or social gathering. And like all our subs, the crowd-pleasers that populate our party boxes always feature bread made from scratch and fresh cut ingredients. In fact, your guests may love PSUB’s party boxes so much that you’ll have trouble getting them to leave. 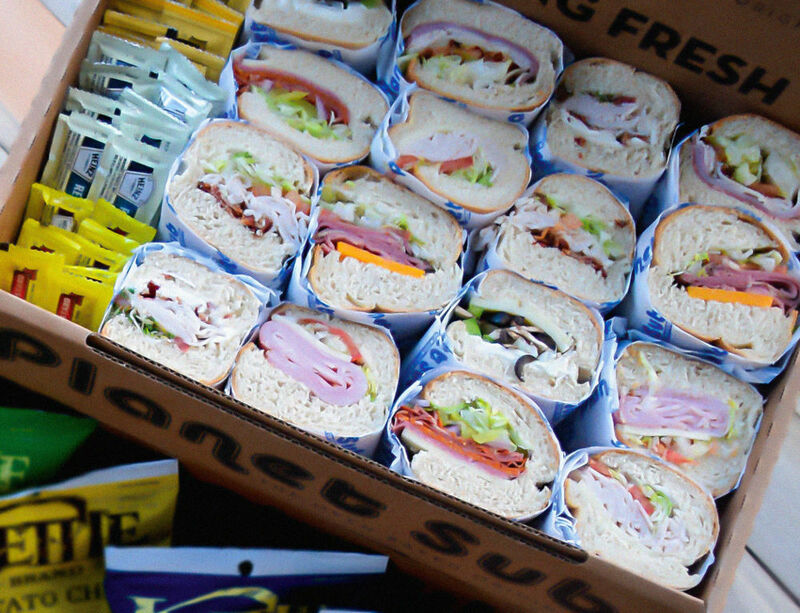 We never cut corners when prepping our sandwich party boxes — only subs. Even when ordering our sandwiches en masse, you can expect our signature fresh, made-from-scratch bread, hand-sliced veggies, meats, and cheeses, and homemade sauces. And our convenient delivery makes it easy for you to focus on hosting duties rather than worrying about transporting your PSUB party boxes. At Planet Sub, we aren’t just another sandwich factory. We are creators who have crafted some of the most savory sandwich combinations available. We’re proud of pushing the culinary boundaries and would never offer watered down versions of our subs on party boxes. So when it comes time to select sandwiches for your party boxes, you can choose as many different combinations required to suit your catering needs. And when we say as many combinations as your heart desires, we mean it! We grant you freedom to make your party trays as large as you want, with all your favorite subs; your appetite is your only limitation. Custom party trays are available — just call in advance for large catering orders. If you have guests with special dietary restrictions, our party boxes can cater to their needs, too! We provide lettuce wraps, tortilla wraps, and gluten-free breads, plus tons of vegetarian and vegan offerings. For catering details, find a PSUB near you!